SÃO PAULO, Brazil — Until recently, I thought that being a writer was the most pitiful profession ever, especially in Brazil. Nobody reads our books, and we can easily spend an entire life just railing against the same things again and again. In general, we Brazilian writers have no impact at all. A bunch of local capybaras that are also believed to tell fortunes garner more respect than we do. But then I found another job that is even more heartbreaking: the United Nations special rapporteur. The rapporteurs are independent experts working unpaid on behalf of the United Nations to monitor countries, governments and policies. They are usually appointed with three-year mandates. And they are completely ignored. My brave, dear friends: I understand your pain. Every time I do research into a serious local matter related to, say, education, the environment, police brutality, racism or women’s rights, I find a stern, accurate, fact-filled statement from a special rapporteur condemning the situation. Again and again. Almost two years ago, for example, Juan E. Méndez, an Argentine human rights lawyer who had been appointed special rapporteur on torture and other cruel, inhuman or degrading treatment or punishment, urged Brazilian authorities to immediately address prison overcrowding, as well as implement measures against torture. After visiting many of Brazil’s prisons and jails, Mr. Méndez collected credible testimonies on torture and ill-treatment by the police. He recommended that Brazilian authorities urgently provide custody hearings for all detainees within 48 hours of arrest and redesign those hearings to encourage victims to speak up and to allow for effective documentation of torture or ill-treatment. But who would listen to an Argentine, right? In the year since he issued his report, Brazilian prisons have reported more than one violent death per day. The incarcerated population has grown regularly since the special rapporteur’s report, and in the first 15 days of 2017, more than 130 inmates were killed during clashes between rival gangs. In 2016, Victoria Tauli-Corpuz, an activist from the Philippines who had been appointed the United Nation’s special rapporteur on the rights of indigenous people, visited Brazil to identify the issues facing the native population and to follow up on recommendations made by the previous special rapporteur. She documented not only “a disturbing absence of progress in the implementation of his recommendations” but also a serious regression in the protection of indigenous peoples’ rights. Later, Ms. Tauli-Corpuz also highlighted the fact that immediately after her mission, many of the communities she had visited registered an increase of attacks. So these special rapporteurs are not only ignored but apparently also challenged. “I deplore that despite my prior alerts, state and federal authorities have failed to take prompt measures to prevent violence against indigenous peoples,” Ms. Tauli-Corpuz said when another preventable death occurred just three months after her initial report. The same thing has happened with a constitutional amendment establishing a cap on the growth of public spending. The Senate boastfully approved the amendment just days after the release of a condemnatory report by Philip Alston, a United Nations special rapporteur on extreme poverty and human rights. In Mr. Alston’s opinion, the law, which imposes a 20-year cap on federal spending, would “lock in inadequate and rapidly dwindling expenditure on health care, education and social security, thus putting an entire generation at risk of social protection standards well below those currently in place.” The government’s answer? Whatever. But the rapporteurs shouldn’t feel singled out. It’s not personal, you know. 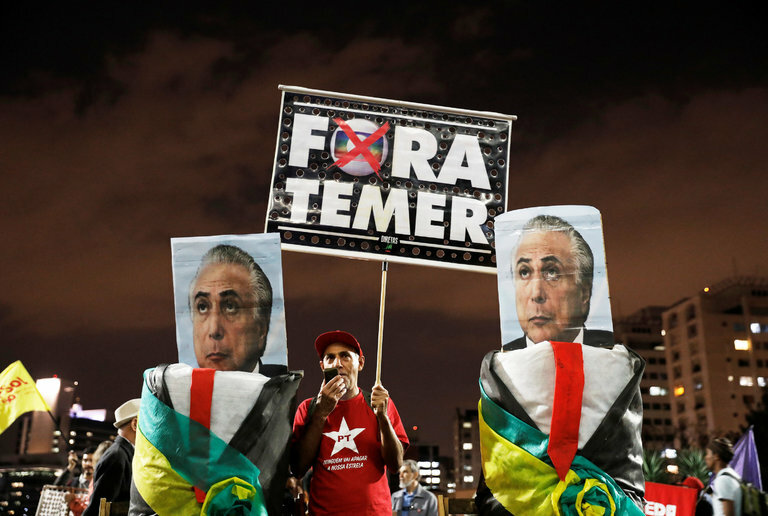 The Brazilian government’s ability to ignore its critics is universal. According to a Datafolha survey, 60 percent of Brazilians opposed the expenditure cap before it was approved anyway. More than seven in 10 Brazilians reject plans for pension reform, and nonetheless a pension-reform law is on the verge of being passed. One legislator said that popular protests — of which there have been many — were not going to change their votes. President Michel Temer himself has declared that the “modernization of national legislation” will continue and that any “broad, sincere debate” should be held at the appropriate arena: the Congress. So there’s no use in protesting in the streets, organizing strikes, asking for direct presidential elections — or being a United Nations-appointed expert, for that matter. Nobody besides businessmen or crooked politicians will do. Mr. Temer’s approval rating has recently dropped to 7 percent. Last month, Brazil’s prosecutor general officially charged him with corruption. Other charges of bribery and obstruction of justice are being prepared. “They want to stop the country, stop the Congress,” Mr. Temer has said, arguing that those accusations are an attack on the presidency itself. “I won’t let that diminish my mood,” he added. A clairvoyant capybara would make for a more democratic leader. A version of this op-ed appears in print on July 12, 2017, on Page A12 of the National edition with the headline: The worst job in Brazil.